This study used a comprehensive approach, including kinematic and EMG data analysis to determine how normal gait patterns may change as a result of professional non-cyclical sport activity and to determine the electromiographical pattern of m. adductor longus. The study was performed on 37 professional fencers and 68 healthy nonprofessional subjects as the control group. Gait analysis was performed using the zebris three-dimensional ultrasound-based system with surface electromyography (zebris). 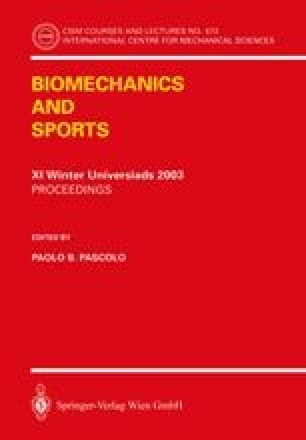 Kinematic data (spatial-temporal parameters, knee joint kinematics and relative ligament-movement parameter) were recorded for the lower limb. The examined muscles include vastus lateralis and medialis, biceps femoris and adductor longus. The analysis of values of professional and non-professional subject shows that the influence of well — proportioned muscle is not due to a reduction of muscle activity during the all-days-motion, but rather a more complex neuromuscular mechanism, which brings about effectiveness in gait and a joint stability. The EMG traces of m. adductor longus show an adductor longus avoidance gait for one small part of subjects, which does not depend on gender, age and sport activity level. The results suggest that the reduced rotation of thigh could result a reduced rise in adductor longus EMG activity during preswing.